November 22nd, 2015 – Grand Canyon Arizona – Sweeping views along the South Rim trail and the bus along the Hermit’s Rest road. Its November so the days are warm but not hot, and the nights cool if not cold. There was a quick storm that rolled through and dropped some snow, remnants can be seen in shady spots here and there. The grand canyon association and national park service has a great set of videos that give a little deeper overview. I actually saw the sunset first, then spent a night and most of the following day here, but I like the presentation of the pictures below as if it were one long day. I had just come through Sunset Crater and Wupatki National Monuments. Back on the main road heading north I turned west at Cameron. Sections of this road had been paved earlier this year and were smooth as silk. The smooth wide open road, warm afternoon breeze and bright blue skies with sweeping views made this part of the drive quite relaxing. The sides of the valley were layered rocks whose colors were glowing brightly in the afternoon sun. 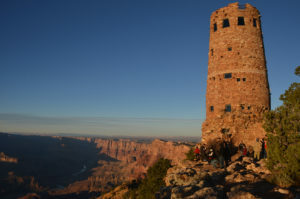 I arrived at the Desert View Watchtower as the sun was setting. Off season means easier parking and late in the day it was pretty easy. But, I just missed the opportunity to climb the tower to the observation level. If you are planning a visit you might consult this page for hours of the various attractions. 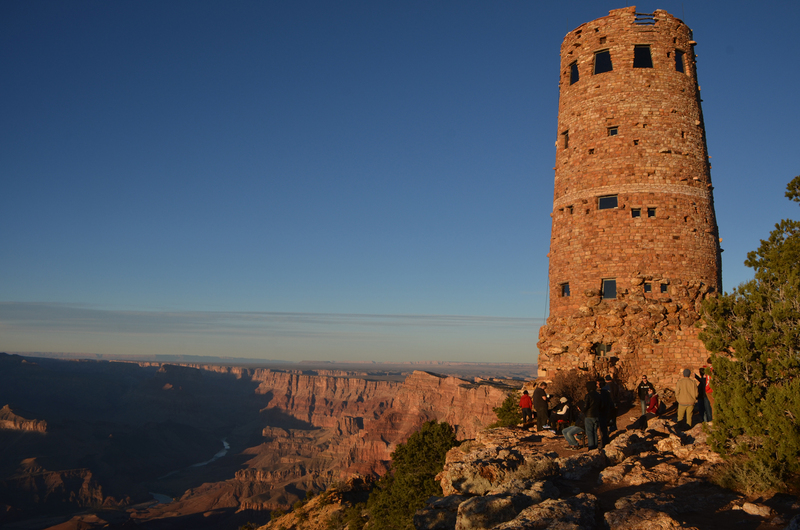 The watchtower is a 1932 construction with a metal skeleton, but inspired by buildings of the Puebloan people in the area. As with most popular places, getting photos with a minimum number of people milling about was challenging. Sunset here was about all I was able to take in on my first night. So off to my camp at the Trailer Village. After dropping the trailer, I headed over to the Market Plaza and grabbed some food. I poked around to find some WiFi, as cell service wasn’t available. The usual goals were in effect, figure out what’s here, figure out what to see – one, two and three days ahead. This was the first place I had experienced a free WiFi network that shut down access as the hour got later. The network was available but the DHCP revoked all the leases and wouldn’t issue new. I moved to another spot nearby, over in the hotel, but this network was so congested that it was pointless to stay. Next morning I was up and checking with the ranger about another night, but no luck. So I hitched up the trailer and moved to the main visitor’s center parking lot. From here I took the blue line bus over to the Hermit’s Rest transfer point and picked up the red route along the canyon’s rim. The rim trail and the bus both follow the canyon out to Hermit’s Rest. A simple matter to hop off, take some photos, and pick up the next bus a few minutes later. Occasionally the bus was too full to pick up everyone waiting, but I didn’t experience this myself. 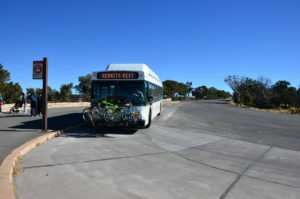 Signs along the trail indicate distances not just along the trail, but to the next bus stop. Look at the other side of the sign (as if you were traveling the other direction) and see information relevant to hiking the opposite way. I hoped off the bus several times to take photos, sometimes walking to the next bus stop along the rim trail. 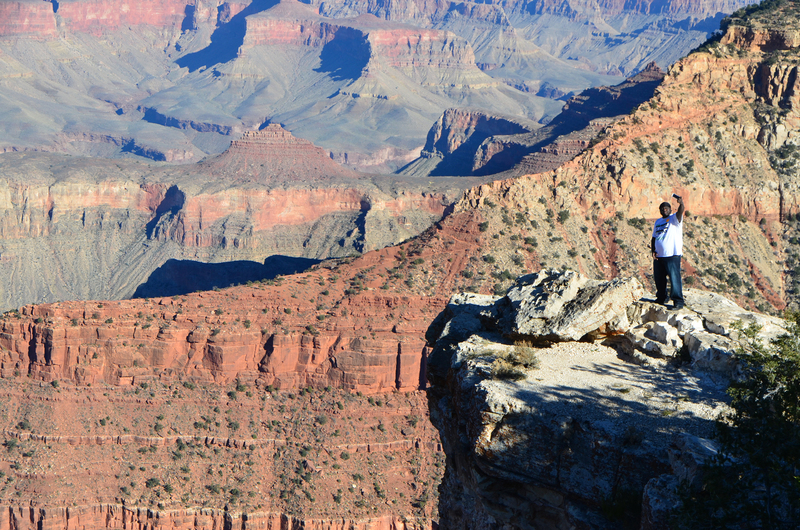 It seems that along the rim of the canyon exists a pretty distinct ecosystem extending only a few hundred feet back. Plants are compact and hardy from fighting the wind, sun and rain. The trees are twisted and gnarled, the shrubs low and compact. 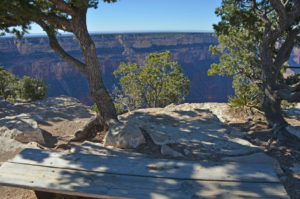 The trail has many viewing spots, sitting benches and the occasional picnic table invite you to take a few minutes to soak in the surroundings. Many interesting plants here, various juniper trees laden with berries, grasses and flowers going to seed. One bush that was going to seed was very intriguing. 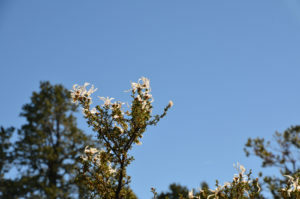 The spent blooms sported small twisty white feathers. After returning home I have learned that the feather is attached to a single seed, helping to distribute them widely. The twisty shape seems to help drill them into the ground as well. We believe this was the Mexican Cliffrose, although the Mountain Mahogany sports a similar seed. I expect that a few weeks ago these entire bushes were covered with rose blooms. 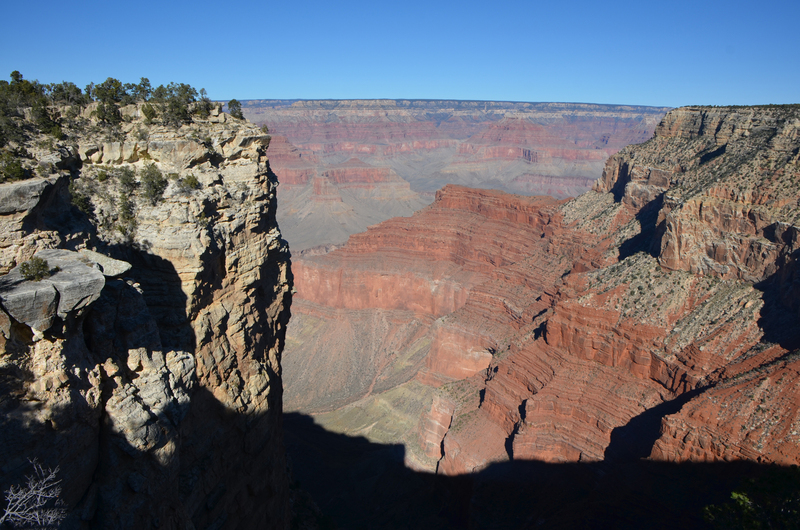 The edge of the canyon drops off very abruptly, often the edge is formed by large rocks. At some viewpoints railings invite you to wander right up to within a foot or two of the edge and look down. But typically the edge is unprotected. 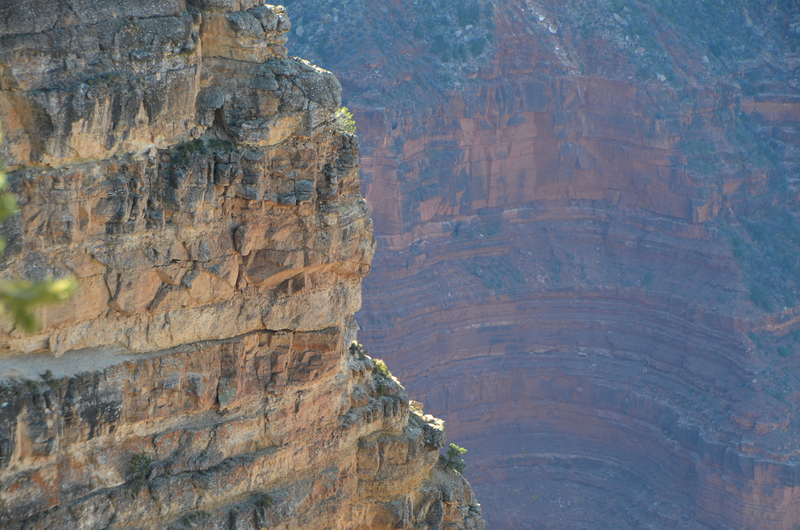 Usually the view of the cliff below your feet is from a point and looking back to the left or right along the rim. Deep in the canyon you can see the river shimmering in the sun, only the biggest movements visible from this far away, seemingly in slow motion. The depth of the scene is elusive, look at the rocks nearby and scan away into the distance trying to imagine that same detail repeated. Huge rocks in the distance appear to be grains of sand and eventually just a smooth color in a painting. As people left the bus at each stop there was an opportunity to move to a better seat. On the way back I had been on for several stops and had a bench to myself. I held my day pack in my lap to keep the seat open, and eventually as the bus filled up a couple of young ladies came on board, split up, one taking the seat beside me and the other a couple rows back and on the other side of the aisle. Not much later the folks on the other side of the bus got all excited and started standing up as the bus slowed to a stop. The girl beside me had stood up and was looking too, but there was little chance for me to see past all the people, so I stayed seated. As the bus started moving again, I asked in a normal conversational tone “So, what did you see?” This triggered a shocked reaction, as she quickly turned to her friend behind and they started talking. But not in English, rather they exchanged a flurry of words in some other language. Then she turned back to me with a meek smile and ventured just one word in answer. Slowly and deliberately she said “Bambi?” Of course I got the reference, thank you Mr. Disney. They had seen a deer, but neither of them had any idea what the English name for this animal was. We had a pretty good laugh at that. They were getting off at the next stop, so that was about all the conversation. As they got off the bus we exchanged smiles and “good bye” in English. Back at the main visitor’s center the crowds were thronging about. Huge family groups posing for photos. Here the trail consists of wide paved walkways, lots of benches and side areas. 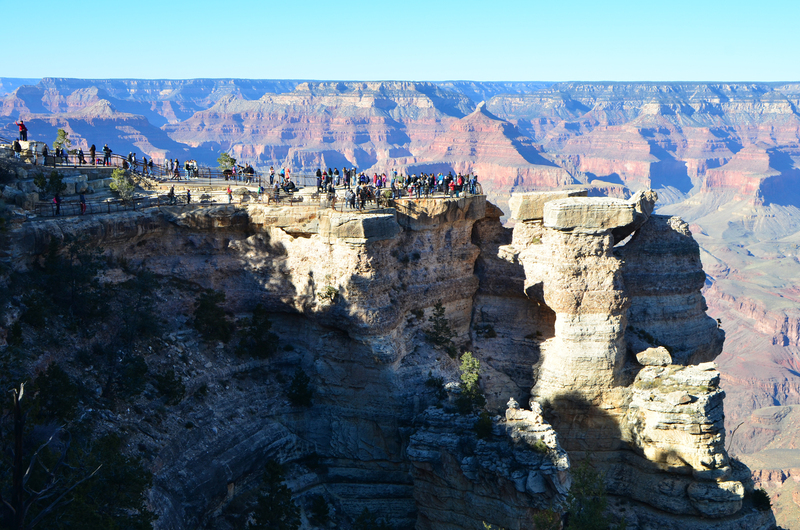 Railings along the length of the rim here give even those with a bit of vertigo something to hang on to. Signs urged visitors to stay behind the railings with dire warnings. I was amazed at how many groups of people were ducking or climbing the rails and wandering out onto the rocks beyond. 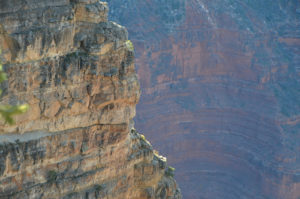 The immediate drop was easily hundreds of feet onto steep slopes that presented perhaps thousands of feet of exposure. The people wandering out there were clearly not outdoor types, posing for selfies with their phones. I waited for a photo at one spot where three separate groups took their turns walking out and occupying the rock beyond the railings. If you don’t care for your own safety, I guess you aren’t thinking about how much of other people’s time you are burning while they wait for you to get out of their picture. 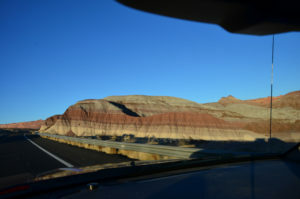 On Highway 64 Between Grand Canyon and Cameron. Amazing layers. Lots of scenery like this. 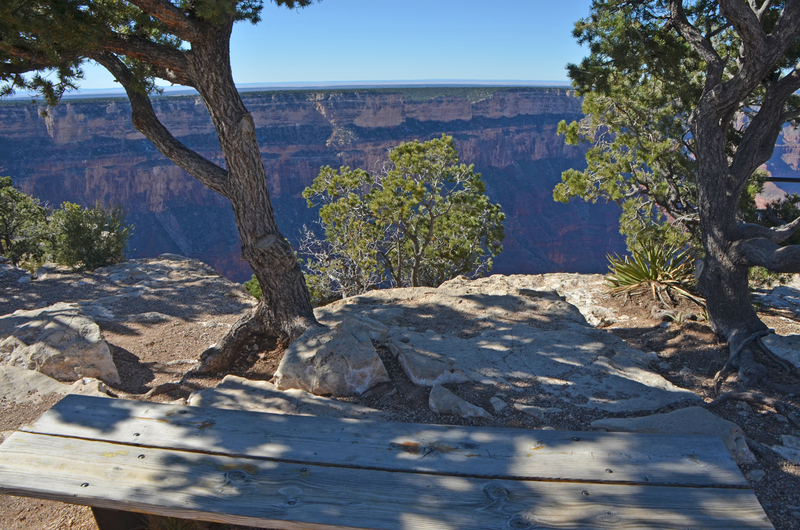 Along the south rim of the canyon the park service operates shuttle buses. Private cars not allowed here, or it would be a zoo. 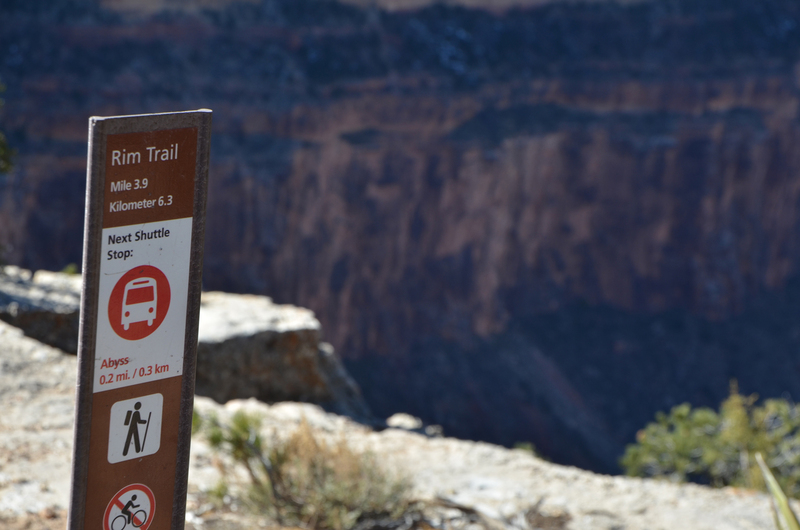 All along the rim trail, these signs provide a lot of useful info to help you make better decisions about hiking versus grabbing a bus, and where you are along the trail. The rim trail ducks behind some low trees. Colorado river way down there. Wider shot of about the same spot. Strategically placed benches provide opportunities to soak in the sights. Several of the trees were just covered with berries. Look closely for the plants making their home on this rock face. Mexican Cliffrose going to seed. Each of these white feathers has a seed at the end. When the seeds are released they will blow in the wind and the twisty feather will help drill them into the soil. More fluffy seeds ready to be let to disperse. Lots of places where big rocks stand on the edge of the canyon. Oh, the railings aren’t for me. I waited for three different groups to cycle through before I got this picture without them. Look at the red rock in the middle ground right behind the white rock in the foreground to see what appears to be an animal trail. The blue tint is from the scattering of other colors by particles in the air. Artists refer to this as “atmospheric perspective” because we recognise this phenomenon as indicating distance and depth in the image.